Runners Inspiring Runners – Krissy Schintgen | So What? I run. So far my Runners Inspiring Runners series have been about runners that I personally know. As my reader-base grows, I’m meeting more and more runners and am inspired by their stories. I’d like to introduce you to one of my readers who has a very inspiring story, Krissy Schintgen, who started running despite suffering two strokes. ME: When did you start running and why? KRISSY: I started running September 29th at 9:37am. My inspiration was my daughter. In order to understand you need some back ground. At the age of 14 I had a stroke which required brain surgery then at the age of 23 I had another stroke while I was 38 weeks pregnant with my daughter. I had lost the feeling on my right side. I was now left handed and one handed at that. Last November Lily joined an after school program called Girls On The run. It’s a 10 week program where the coaches teach important life lessons and integrate the program with running. At the end of the program the Girls and their running buddies participate in a nationally known 5K (Girls On The Run 5K). This program is amazing on so many different levels. Well, last season, Lily’s running buddy had to be a coach because I wasn’t in any way shape or form able to run with all my medical issues and pain, and my husband wasn’t sure if he’d be able to get off of work. All of the other girls got to run with their moms, but I couldn’t do that for Lily. Then it started… on November 29th, 2012 at 9:37am I threw down my cane, stepped out of the front door and starting walking and very slowly jogging. I had no idea where I was going or what I was doing, but there was NO way I’d miss my daughters next season. After months of training and sweating on my own, I worked up the courage to put myself out there as a runner- I helped coach Lily’s group in her second Girls On The Run season. June 8th, 2013 became another special day of my life that I’ll never forget, because on that day I got to run with my biggest inspiration, my daughter. What I have become by achieving my goal of running this race with my daughter is nothing that can be put in words. ME: Was was the most challenging thing about running? KRISSY: Not listening to the voice in my head that has been telling me for so long that I am not worth it and that I can’t do it. ME: How has running changed you? KRISSY: It has given me the courage to seek out and find others in a similar situation. I started a Facebook page called Not Fast Just Fabulous. Since then, I’ve encouraged and inspired thousands of people. I have had two news interview and continue to do amazing things. Such as learning to ride a bike last a couple of weeks ago. ME: Have you ran in races before? KRISSY: I have ran 4 5k’s and 3 10k”s What race was most meaningful to you? The Girls On The Run Race. It was the entire reason for all that I have become from running. ME: What do you hope to accomplish in the future? 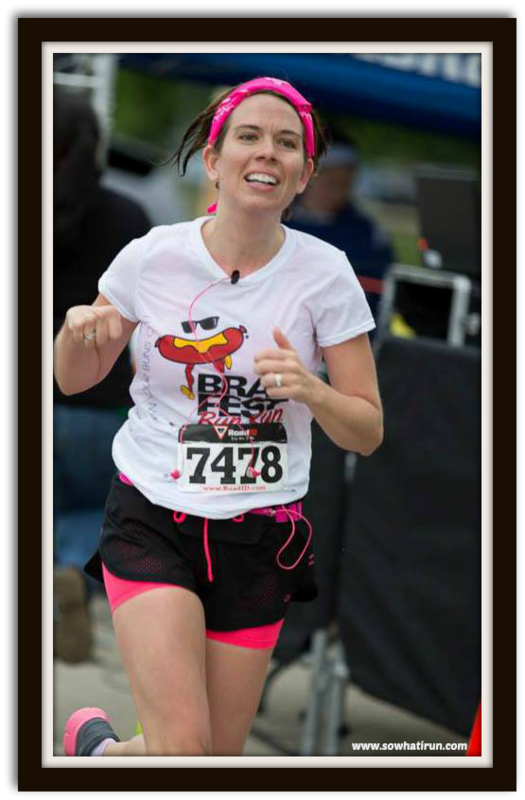 KRISSY: My goal is to raise $1000 for the Challenged Athletes Foundation by running my first Half Marathon November 10th. ME: What’s the funniest thing that has ever happened to you during a run? KRISSY: It was a beautiful day out. I was about three miles from home when all of a sudden it started hailing…out of no where! While running in the hail, I also threw up my breakfast! ME: Do you train with groups or by yourself? KRISSY: On Monday’s I run with a Run Group, 3 other days a week I run alone. ME: How do you stay motivated? KRISSY: I stay motivated by all of my Fabulous Followers on my Facebook page! ME: What is your most favorite piece of running gear? KRISSY: I can’t live without my SPIbelt! ME: Do you listen to music when you run? If so, what is your go to song? KRISSY: Yes. I do not have a specific song, but anything I listen to has to be fast paced! This entry was posted in Runners Inspiring Runners and tagged Challenged Athletes Foundation, Half marathon, Inspirational stories, Runners Inspiring Runners, Running by SoWhatIRun. Bookmark the permalink. A Blog Interview about my Story!